NewVistas engineers have made a prototype of the small kitchen that would be used by NewVistas residents. Blocks of Barre granite are used to test drilling equipment at the company Hall owned. Hall and engineer Ben Jenson, who working on designing the cube-shaped building blocks of the community. Utah engineer David Hall has been buying hundreds of acres of land in the central Vermont towns of Sharon, Royalton, Tunbridge and Strafford where someday he hopes to build a high-tech community of 20,000 people. Hall says his project, which he calls NewVistas, is still many years off, but some of the building blocks are being assembled at the NewVistas Foundation headquarters on the outskirts of Provo, Utah. Hall is planning to spend at least $150 million to develop his ideas, which he says will involve building prototypes and even entire communities at other sites before any construction occurs in Vermont. He is spending some of the money to build a new 80,000 square-foot facility at a Provo industrial park he owns, where he hopes to create the systems for his planned community. There are 150 employees on the foundation’s payroll – most of them engineers. One team is developing toilets. It may not seem like the most obvious starting point for building a community of the future, but water use and waste disposal are big issues. The toilet that engineer Jared Reynolds demonstrates lights up around the rim, rainbow-style. It currently flushes only golf balls but a finished product will use foam instead of water, and it will monitor health by testing the waste it flushes away. A composting system for waste is still to be developed. 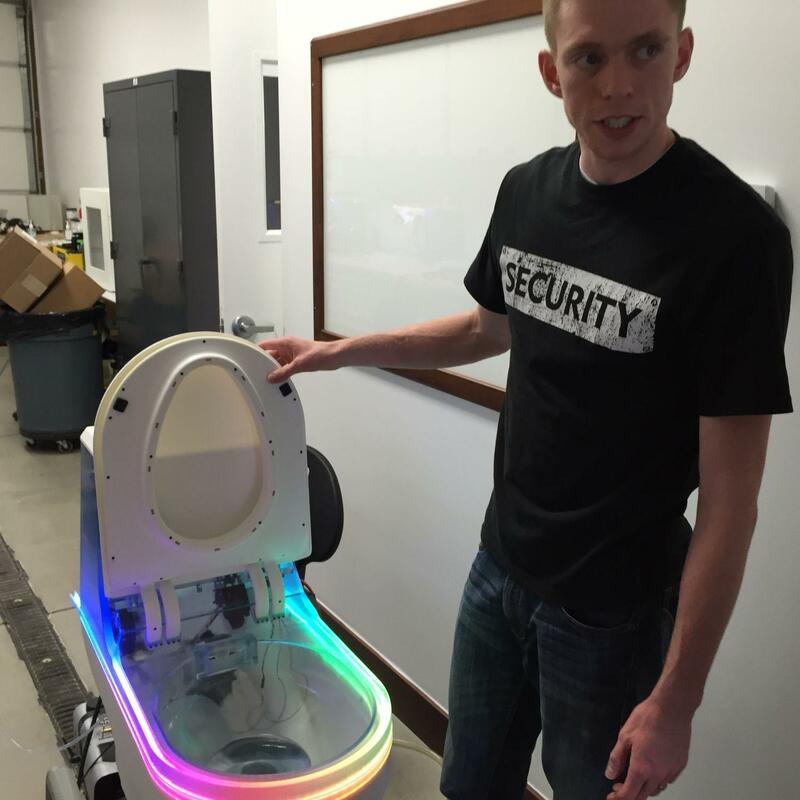 Engineer Jared Reynolds with a prototype toilet that would monitor the user's health. Other engineers are working on the design of a small kitchen. “Imagine a kitchen that’s in a 4-by-4 area but it does everything a full size kitchen will do,” says its designer, Joseph Blanch, as he demonstrates a motorized vertical carousel where utensils and appliances can be stored. The size of the kitchen is important because each family’s living space in a NewVistas community will be only 200 square feet; 4-by-4 is a key dimension because cubes that size, stacked and connected, are the building blocks of the structures. In theory, the living space can be transformed from a dining room to a bedroom, or any other room in a house simply by moving soundproof vinyl walls and storing furniture inside the cubes. For the moment the building blocks exist only on architectural engineer Ben Jenson’s computer. Like all of the engineers we met, Jenson is young and male. He's warmed to the idea of living in a NewVistas community. “It’s getting more appealing to me,” says Andrew Priddis, the project manager for the tiny kitchen. “My wife is a different story.” Priddis says he’s attracted to a living situation that doesn’t involve the financial stress of homeownership. Jared Reynolds, the toilet engineer is also attracted to the idea of a life where most things are community owned. “Everybody has access to a boat, everybody has access to all the luxuries they could possibly think of. You have your own little private space, so it’s really incredibly space efficient but you still have all the luxuries,” he says. Engineers working at Hall’s foundation are developing other systems as well, like an elevator that can climb the walls of a vertical column of four by four cubes. Hall says the most important part of NewVistas is not housing, but commerce. A key part of that is the drilling technology Hall himself developed for Novatek, the Provo company he founded and sold last year. If drilling through Vermont granite seems like a tall order, it’s not. Hall has been doing it for years. Novatek uses blocks of Barre granite to test its drills. Hall says the hardness and consistency of the stone make it ideal. As Hall envisions it, the economy of a NewVistas Community will be based on small-scale business and industry. There are several examples already in existence, run by Hall’s children. Most striking is Vanderhall Motor Works, operated by Hall’s son, Steve. 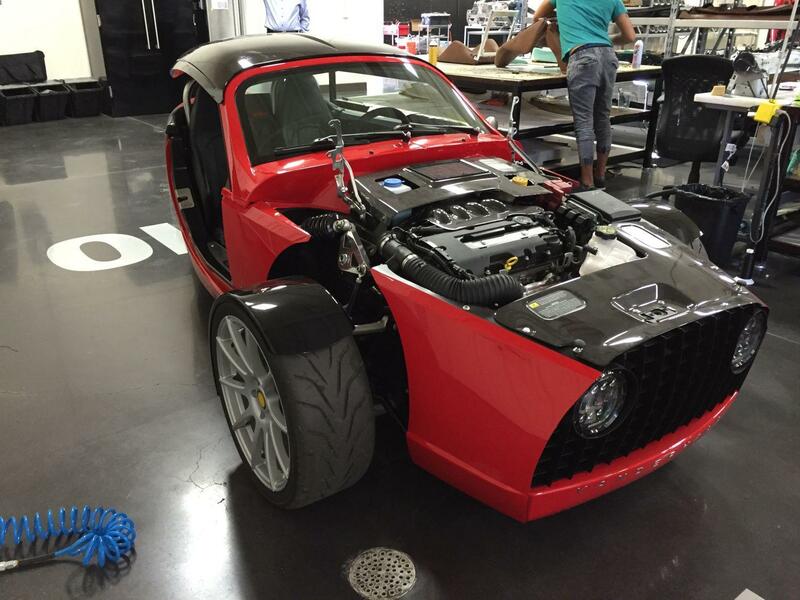 The company is turning out three wheeled vehicles that are somewhere between sports cars and motorcycles. The aluminum frame and carbon fiber body is made by the company, but the engine and braking system are made by General Motors. The company started production one year ago and is producing one vehicle per week. Hall says in the future the same technology can be used to design other vehicles with electric engines and batteries, once major manufacturers ramp up production. Vanderhall Motor Works, owned by Hall's son, is an example of the small-scale industry central to his community concept. The goal, he says, is to scale industry so it can happen locally. But ‘local’ is just what’s missing from the NewVistas plan, according to Diane Gayer of the Vermont Design Institute, a community planning organization in Burlington. Sustainability depends not only on what happens inside a community, but its impact on those surrounding it. Gayer says Hall’s community might be achievable, it might embody good ideas and many people might be attracted to it, but it is out of scale for Vermont. “I think we really care how and where and why and I think this begs all of those questions,” she says. She suggests a better approach would be collaborative and democratic. “It feels different than one person coming down from above and just landing this thing and saying, ‘this is going to be the future...as opposed to a lot of people coming together who really want this,'” she says. There’s also a human engineering aspect to Hall’s project. Assets are pooled and community leadership is highly structured. Gayer says in many ways NewVistas is part of a succession of utopian communities proposed in American and Europe since the 1700s. Communities based on socialist principles were designed by Charles Fourier two centuries ago. Architect Paulo Soleri designed huge vertical cities called "archologies" in the last half of the 20th century. “It’s an idea by a person who then gets enough followers to make some of it happen,” says Gayer. She says many of the utopian ideas were based on religion. Although Hall says NewVistas would not be a religious community, he has based his ideas on the Plat of Zion, by Joseph Smith, the founder of the Church of Jesus Christ of Latter-day Saints — the Mormons. The land Hall is buying in Vermont is near the Joseph Smith birthplace. Hall is convinced his ideas are answers to daunting problems of environmental degradation, depletion of resources and even poverty and inequality. What about the ills that beset every community, like unemployment and substance abuse? Hall says current thinking is that those allowed into NewVistas would be required to have jobs in the community or own a business. “That’s kind of your ticket in,” he says. Richard Register of the Oakland, California-based non-profit Ecocity Builders has spent time with Hall and visited him in Provo. Hall has given grants to Register’s organization. In his work and his books, Register has argued for ecologically designed cities. He has issues with Hall’s emphasis on technology and some features of the NewVistas design but he says people who live in towns where Hall is buying land should be willing to listen to Hall and make room for solutions to problems we face. But families living for generations, anchored on their farm, are part of Vermont’s identity. Those families and other people who live in the area — like Eric Becker of Strafford — see Hall as the inflexible one. “It seems like a very top-down and unilateral process not in keeping with Vermont’s culture,” says Becker. As a partner in Clean Yield Asset Management in Norwich, Becker works on investing in sustainable agriculture and clean energy. If it was an investment opportunity, NewVistas is not the kind of project Becker would put money into. "We do look at companies that have grandiose visions of sustainability and often there's a lot less there than meets the eye, or its really papering over some really substantial issues. This looks like a science fiction fantasy of what sustainability could be in the future," he says. Becker says Vermont is already going in the right direction without Hall’s radical approach. “You don’t need a utopian master plan to make it happen. It’s happening organically,” he says. Becker says Hall’s goal of local food and energy production and a small-scale economy can be achieved in a way that’s much more suited to Vermont. Residents in Central Vermont towns are concerned about Utah engineer David Hall’s plans to buy 5,000 acres to build a community of 20,000 in their area. There's also opposition in a Provo, Utah neighborhood where Hall is buying property for similar ends. The Utah man who wants to build a unique project in Central Vermont says he is poised to purchase an additional 500 acres of land. A developer from Utah who has purchased 900 acres in Royalton, Sharon, Tunbridge and Stafford to create a 20,000 person closed community, has not filed any permits for the project yet. A Utah developer’s plans to build a 20,000-person settlement in Orange and Windsor counties could make it difficult for a Tunbridge family to keep living their rural lifestyle.